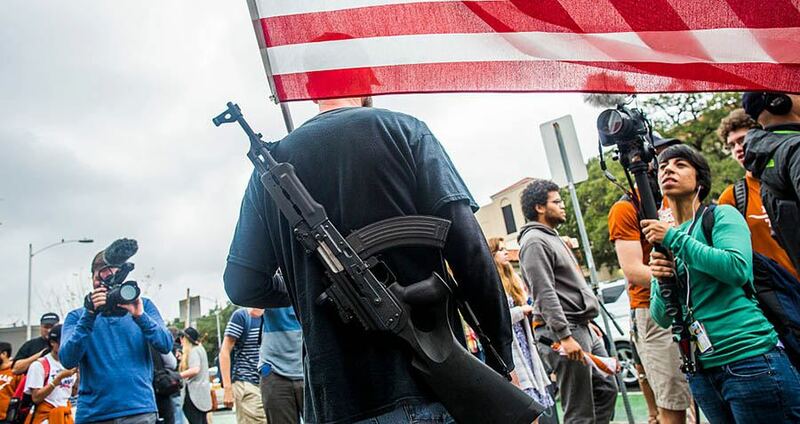 Drew Anthony Smith/Getty ImagesGun activists march close to The University of Texas campus in Austin, Texas. A new “campus carry” law allows certain college students in Texas to bring guns into classrooms. Passed on Monday, the law permits people at or over age 21 to have a concealed handgun license to carry pistols in classrooms and buildings throughout public colleges, Reuters reported. Critics say that allowing students to carry guns in classrooms will only engender danger — not decrease it. Still, its supporters, including Texas Attorney General Ken Paxton and Governor Greg Abbott, say the law will aid in preventing mass shootings. “What campus carry does is that it only authorizes those who go through the special training and background” to carry firearms, Abbott said, according to his office as quoted in the Reuters report. University of Texas President Gregory Fenves opposed the law, saying that he does not think “handguns belong on a university campus,” but “reluctantly” allowed campus carry, as he said state law compelled him to do so, Reuters reported. Over the past several months, university professors have openly criticized the law — and attempted to block it. In July, three University of Texas professors — Jennifer Lynn Glass, Lisa Moore, and Mia Carter — sued the university and state as the law is forcing the school to impose “overly-solicitous, dangerously experimental gun policies” that violate the First and Second Amendments, the Texas Tribune reported. Still, legal experts say that the lawsuit has little chance of blocking the law, as precedent already exists to allow it. Indeed, eight U.S. states already allow students to carry concealed weapons on public postsecondary campuses, and none of these laws have been overturned. “To put it in terms these professors should understand, the clinical trials are over, and campus carry has been has been shown to pose little risk to public safety,” representative Antonia Okafor told the Texas Tribune. The law, passed on the 50th anniversary of one of history’s deadliest gun incidents on a college campus, permits private universities to opt out of the law’s language. Most have already done so, citing concerns over student safety. Next, read these shocking statistics on mass shootings in America. Then, have a look at five gun control facts that both sides need to stop getting wrong.